The term collision domain defines the set of devices for which their frames could collide. All devices on a 10BASE2, 10BASE5, or 10BASE-T network using a hub risk collisions between the frames that they send, so all devices on one of these types of Ethernet networks are in the same collision domain. For instance, all the devices in Figure 3-9 are in the same collision domain. LAN switches overcome the problems created by collisions and the CSMA/CD algorithm by removing the possibility of a collision. 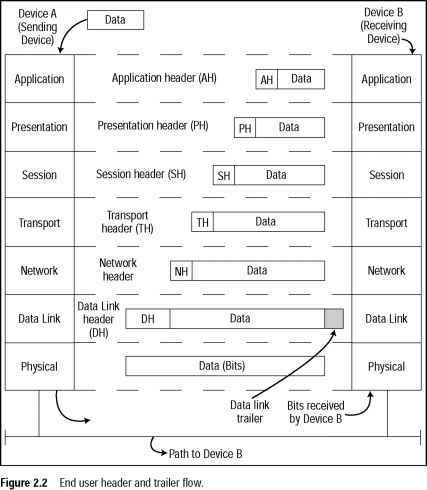 Switches do not create a single shared bus, like a hub; they treat each individual physical port as a separate bus. Switches use memory buffers to hold incoming frames as well, so when two attached devices send a frame at the same time, the switch can forward one frame while holding the other frame in a memory buffer, waiting to forward one frame until after the first one has been forwarded. So, as Figure 3-10 illustrates, collisions can be avoided. In Figure 3-10, both PC1 and PC3 are sending at the same time. The switch looks at the destination Ethernet address and sends the frame sent from PC1 to PC2 at the same instant as the frame is sent by PC3 to PC4. The big difference between the hub and the switch is that the switch interpreted the electrical signal as an Ethernet frame and processed the frame to make a decision. (The details of Ethernet addressing and framing are coming up in the next two sections.) A hub simply repeats the electrical signal and makes no attempt to interpret the electrical signal (Layer 1) as a LAN frame (Layer 2). So, a hub actually performs OSI Layer 1 functions, repeating an electrical signal, whereas a switch performs OSI Layer 2 functions, actually interpreting Ethernet header information, particularly addresses, to make forwarding decisions. Buffering also helps prevent collisions. Imagine that PC1 and PC3 both sent a frame to PC4 at the same time. The switch, knowing that forwarding both frames to PC4 would cause a collision, would buffer one frame until the first one has been completely sent to PC4. ■ If only one device is cabled to each port of a switch, no collisions occur. If no collisions can occur, CSMA/CD can be disabled, solving the Ethernet performance problem. ■ Each switch port does not share the bandwidth, but it has its own separate bandwidth, meaning that a switch with a 10-Mbps ports has 10 Mbps of bandwidth per port. So, LAN switching brings significant performance to Ethernet LANs. The next section covers another topic that effectively doubles Ethernet performance.